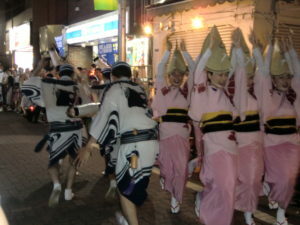 Awa dance is performed in Japanese bon festivals. 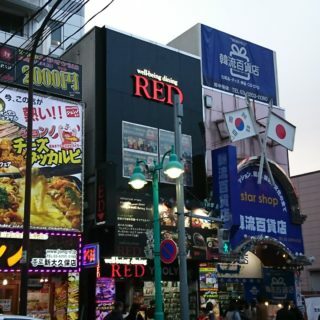 | Why don't you go on a trip to Japan? 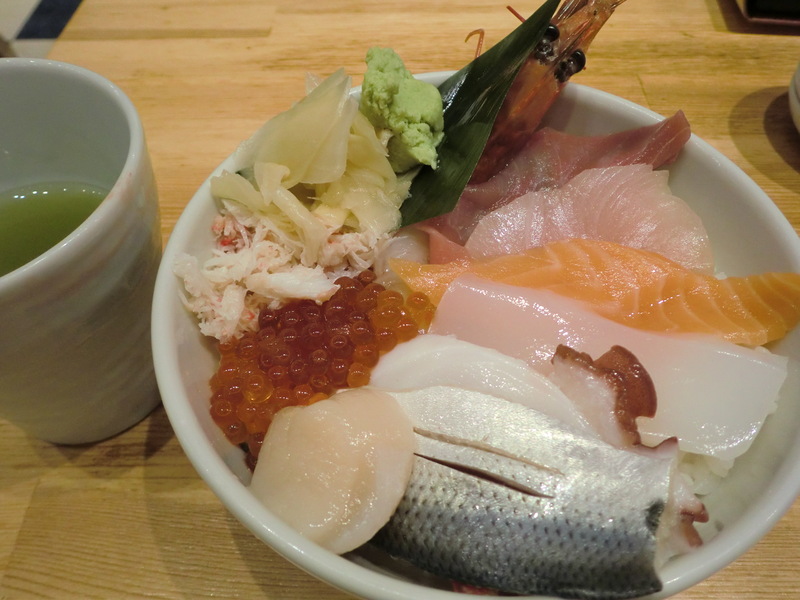 Japan’s summer is in a season with many festivals. When visiting Japan during the summer season, you may encounter a festival somewhere in this country. Various festivals are held from a small festival held by a town community association to large ones visited by tourists from all over the country. In addition, fireworks festival is held nationwide in the summer as well. 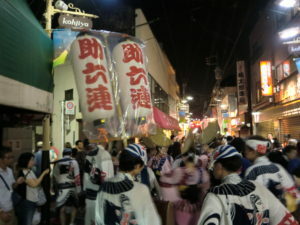 Awa Odori, or Awa dance Festival was held the other day on a shopping street in my town. Today I will introduce Awa Odori. 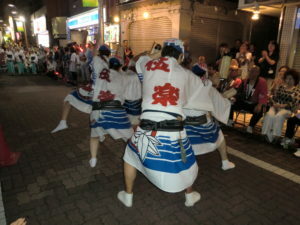 Awa Odori is held in Tokushima Prefecture, which is called Awa on the old days, it is a part of the Bon Festival held from August 12 to 15 every year. 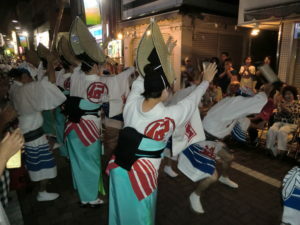 Following the accompaniment of two beat, such as a shamisen, drum, and flute and bell, a group of performers called Ren dances on streets. The Awa Odori in Tokushima is the original, and 13 million people visit sightseeing from home and abroad every year. Groups of choreographed dancers and musicians are called Ren. There are various of Ren nationwide derived from the group of Tokushima, and it develops as a local festival in each town community. And today Awa Odori has known as a Japanese traditional artistic entertainment to worldwide. 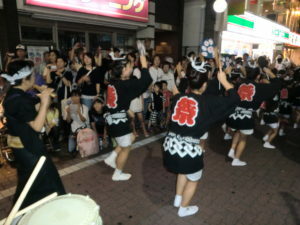 When I saw the festival in my town the other day, more than 10 groups called Ren was dancing on the street. 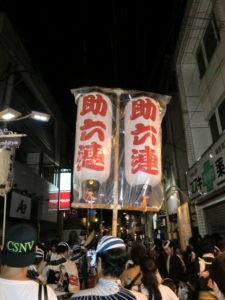 The head of the group has a big lantern written the Ren’s name. 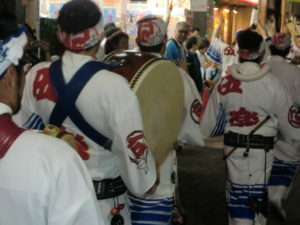 The performers shout “ Yatto-sa, yatto-sa”, while dancing with a unique rhythm on the accompaniment of shamisen, drum and flute. Men and women dance in different styles. Men dance in a low crouch and jump. As women are wearing kimonos, they dance in small steps. And women wear a shade hat called amigasa. 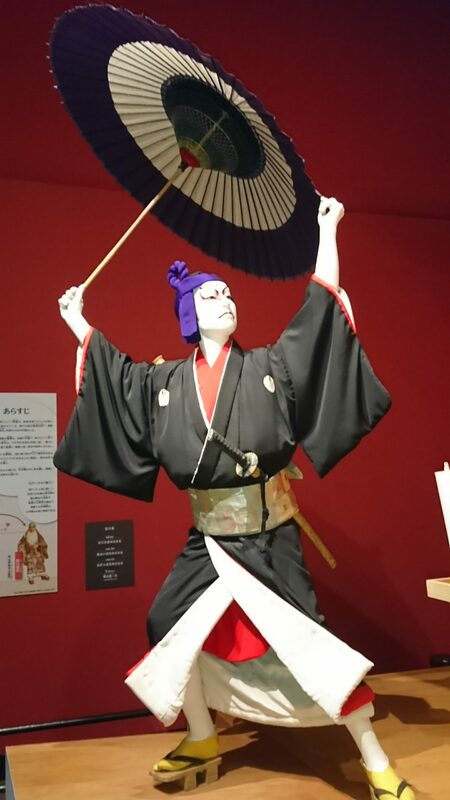 This lady’s kimono is unique to wear. 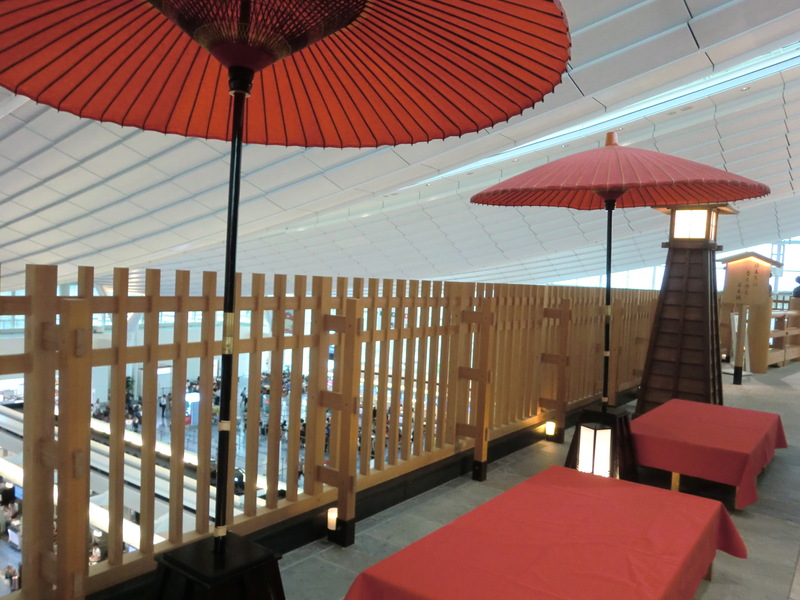 It is different from ordinary kimono and yukata ‘s way of wearing. As I checked it, one hem of a kimono rolls up and one sleeve is pulled. It seems that you can buy awa dance uniform on Amazon. Please check it. Children teams dance the way of mixed for man and woman. When one raises a call as “Yatto-sa”, the other members call “Ah, Yat, Yat”. One ren group dances for about 10 minutes. Dancing style, music, costumes are also different from each team, so it is very exciting. The visitors also cheered according to the dance.